The 20th annual Public Safety Awards program recognizes & honors Santa Rosa’s top law enforcement officers & firefighters who protect and serve the people of Santa Rosa. Our club recognized the need for acknowledging their service to our community and enlisted the aid of the chiefs of their respective departments in selecting the worthy recipients. This is an event that you will not want to miss so be there and bring a guest to share this great program. February 12: Tara Smith of Tara Firma Farms! This week’s Rotary meeting was called to order by President Peggy, who called on Tim Steward to lead us in the Pledge of Allegiance. 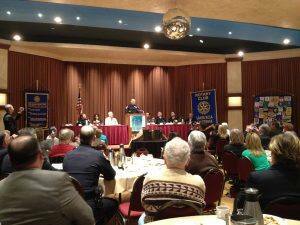 Mike Kallhoff reminded us that the Rotary meetings for January are dedicated to Rotary’s Four Way Test. 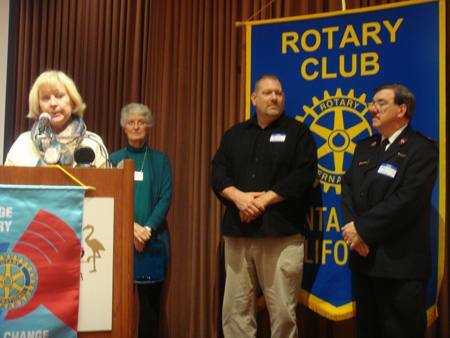 Visiting from the Sunrise Rotary Club of Santa Rosa Sunrise was Doug Robert. Visiting from Garberville Rotary was Bill Stewart. Our guest speakers for today’s program, on behalf of the Santa Rosa Greenway project, were Jim Pedgrift and Thea Hensel. From the The Salvation Army, Corps Commander Major Joseph Murray and Jon George from the local Salvation Army Corps Provisional Living Center . Other visiting Rotarians including Joan Kazmar and Karin Iwata. Yeah! Penny Tibbetts said all was sunny today!! Doug Johnson informed us that today’s Rotary Raffle included a double whammy because no one has drawn the winning numbers in months and today’s jackpot has grown to $1,557 and the odds are about as low as they’ve been in years: Only 17 evil cards and two (2!) Jackpot-winning Jokers. President Peggy’s number was drawn but, alas, her selection from the 19 cards in the blue velvet bag was not one of the two winning jokers, but she gladly accepted her $10 consolation prize. Next week—with the eager support of our fellow Rotarians—the January 29th jackpot approaches record-setting territory. Eileen Carlisle presented a check to Blaine Goodwin and Jon George, to enhance the living facilities for the Salvation Army Transitional Housing. Nice to see such a worthwhile local organization get our support! 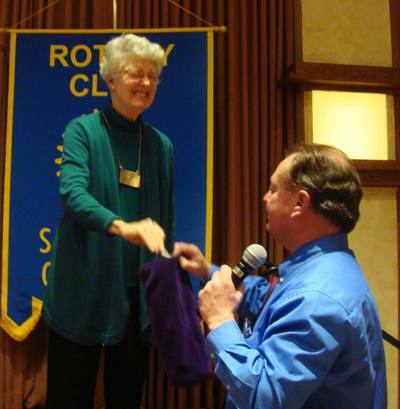 Debi Zaft was quite pleased to see so many Rotarians jump up to answer the January Question of the Month. Past President (1987-88) Rich de Lambert was the fastest with the answer: Sir Umika Ofir, a Rotarian from Nigeria gave a gift of $1,000,000 to the Polio Plus campaign. Rich’s name was added to this month’s drawing for the Rotarian Prize. Because some third-grade classes were short enough dictionaries, Ted Wilmsen urged eager volunteers to return any extra dictionaries to him as soon as possible because some classes were short enough for all the young scholars. Also, Jack Tolin needed a partner for his school and Bob Higgs volunteered. Doug Johnson announced two meetings for this Friday (Jan. 24th) at Carmen Singiniani’s office for the Giro Bello committee meeting, followed by another meeting for the committee and a second meeting at 10 am to discuss a Giro Bello kick-off dinner. Registration starts this Monday, Jan. 27th for our highly-popular cycle race. Posters and fliers of popular sizes are now available to pick up and distribute to highly public places all around. The committee also has a banner that you can borrow for a week at a time to display in your place of business. Every member of your Rotary Club will receive the draft of an urgent email that you are urged to send to every one of your friends, cyclists, everyone you think is interested in Rotary’s single fundraiser of the year. In case you missed that: Forward this email to all of your bicycle-riding friends. Immediately!! At Wednesday’s Rotary meeting Past President Jeanne Levin (1998-99) presented to President Peggy the archives of this 92-year-old Rotary Club with the “Golden Book” of our district’s chronology–listing charter dates of Rotary Clubs from 1915 through 1965 (There was no district organization before 1915). Historical note: Sixty-five years ago—December 1, 1921—the Rotary district we were chartered into included the whole North Coast of California and the Hawaiian Islands between 1937 & 1949. Our Rotary Club’s charter date was listed in the book as Dec. 1, 1921, listing us as the 5th Rotary Club in the western United States. Jeanne passed the relic along to Club Historian Jim Johnson. 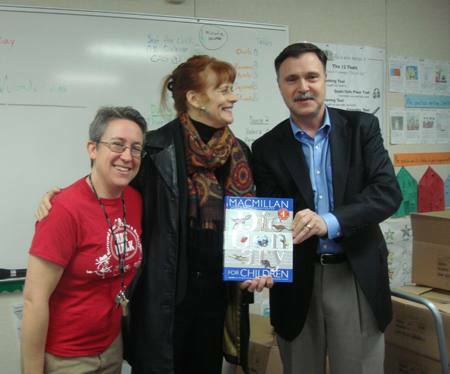 Judy Glenn was recognized for her photo, with Tim Stewart’s wife Carol, that appeared recently the Press Democrat. Judy & Carol are members of a gourmet cooking club that has been simmering along for a number of years. Jeff and Ann Gospe were recognized for a trip to Alcatraz with our exchange student Giovanni. Rumor has it that Craig Meltzner was also with them along Rotarians from other clubs. Ann Gospe announced that she was leaving on a girl’s long weekend trip to Miami. Cecil Humes was recognized for his company’s trip to Nicaragua to do an eye project. The group helped with 990 eye exams over 4 days. Today’s Guest Speakers, Jim Pedgrift & Thea Hensel, are deeply-involved and highly-informed about one of the largest community projects that has been sitting vacant and idle for more than 45 years. A narrow ribbon that stretches more than two miles from the intersection of Farmer’s Lane and Highway 12 (from the east end of the Highway 12 freeway to Spring Lake Park). This is the proposed area for the Santa Rosa Southeast Greenway. Back in the early 1950’s this land was mainly orchards, but in 1959 Cal Trans and the City of Santa Rosa approved of a freeway to go through this area. (FYI, Highway 12 was developed in the 1960s and 1970s, and Spring Lake Park opened in 1974-75. This was the beginning of the end for this right-of-way that was never to become a freeway. By the 1980s most residents objected that it was not needed, they did not want it, and it was removed from the general plan in the 1990s. In 2009 the campaign began to acquire this 2 mile, 50 acre swatch of land from Cal Trans and develop it as a combination park-bike path, gardens-walking trails, etc., etc. 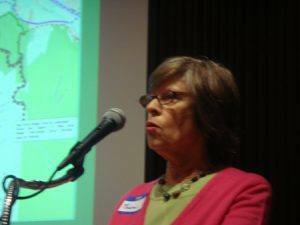 For more information, go to their website www.SoutheastGreenway.org.